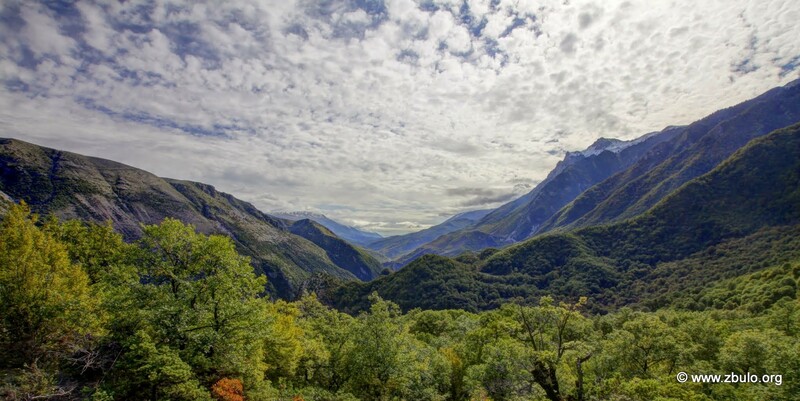 We take you through the famous Zagoria Valley in the southern highlands of Albania. From gorgeous green landscapes to the warm thermal baths of Benje, this hike will truly quench your soul. You will also get to experience the traditional mountain lifestyle and warm hospitality of the locals. Upon your arrival in Tirana, you will be picked up by a Wild Guanabana representative and transferred to our trekking area (200 km / 3:30 h). Flight time allowing, we break up the long journey with stops, stretch our legs on a walk through the harbor city Durres with its Italian flair, and visit the Byzantine monastery of Ardenica, where Albania's national hero celebrated his wedding. Traveling on the highway South, we pass through the agricultural coastal plain lined with colorful produce stalls on and the picturesque landscape of the River Vjosa. We make use of the driving time to get to know more about this little known country and its multifaceted history. Overnight at a family-run pension in a quite location outside of Tepelena. A transfer through the Dropul Valley takes us into the Kelcyra Gorge shaped by one of Europe’s last wild river and to the village Peshtan (45min). The Zagoria Valley is of astonishing character, most of it remains covered by forest, out of which to both sides mountains rise. The Dhembeli-Nemercka and Lunxheri-Bureto Range encompass and shield off the valley from the outside world. Only on an ancient caravan route we can reach the highest pass and soon the almost deserted village Kala, where only one family remains. The river below Limar is crossed via one of Ali Pahsa’s impressive Ottoman stone bridges and we can spot remains of cobbled road. The views to Mt Strakavec, remote feeling and vernacular stone architecture of Limar leave a lasting impression. A stroll through the village reveals its whole extent and we can learn more about life here from our hosts. Overnight in the house of the teacher who takes care of the 10 pupils that remain in the village. The settlements Southbound are connected only by footpaths we use to reach Hoshteve. Passing several traditional villages we have the chance to experience rural lifestyle, meet the locals and admire the mountain splendor above as well as course of the Zagoria River below. Below the village Doshnica a waterfall can be visited at a geologically interesting fold, depending on the water level we may continue along the river or backtrack to the village. Another Ottoman bridge connects Hoshteve with the neighboring villages Nderan and Zhej. The large meadows near the river are used during winter, in summer flocks are driven up the mountain side. Animal husbandry, bee keeping and the collection of medical herbs have been the only sources of meager income, triggering mass emigration to Greece after the turnaround in 1990. Our hosts lived abroad for 17 years, skype daily with their children in the US and opened a bar upon their return. They’re a good example of the diaspora which returns equipped with new skillsets and money to invest. Note- worthy is also the church of the Holy Apostle in Hoshteve, a fine example of Orthodox heritage. A shorter and easier route allows for a relaxed walking day accompanied by views of Mt. Cajupi. The villages Vuthuq, Koncka, Nivan and Sheper are connected by roads and their influence visible on the development of the settlements. Nivan is the center of the commune and remains of military installations and storage depots are visible. Its central square is dedicated to William Tilman, a famed British mountaineer who lived here for a year fighting with the resistance in German-occupied Albania during WW2. Tilman was described as “the 20th Century's last true explorer”. Once more the trail takes us to the river, a monastery and the last of Ali Pasha’s stone bridges. Over meadows Sheper is reached where we overnight in a simple guesthouse of an Aroman / Vllach family, nomadic shepherds who were forcefully settled here during communism. Time can be spend with the family or exploring the village, in particular the neglected museum and buildings on which slogans of Marx and Lenin remain. Over the Dhembel-Nemercke Range we return on a caravan route to the outside world. As the drive around takes locals just as long as the walk across, the challenging crossing is still in use. Marveling about the peaks of Mt. Cajupi Mountain’s across the valley, we climb in a crack uphill to the pastures that serve shepherds, who come from as far as Konispol (the southernmost point of Albania), as their summer quarters. It is not uncommon for the flocks to travel more than 10 days in search of fertile meadows. The alpine valley is bare of vegetation, flanked by steep slopes and the Dhembel Pass (1450m) at its end offers views of the Eastern Highlands, across into Greece and to city Permet far below. The long rocky descent requires attention and leads to Leuse, another beautiful stone village with amazing fresco-covered church, probably the most beautiful in Southern Albania. It is then only a 15min walk to reach the city center and our centrally located hotel. For dinner we taste the city’s famous cuisine, sample wines and raki. There might also be the chance for a private screening of a black and white movie in the aged cinema. On our last somewhat shorter, albeit not less delightful hike, we discover the natural wonders surrounding Permet. After a scenic drive along the turquoise Vjosa (45 min), we start hiking along a water channel, cross colorful pastures and pass old grown Platane trees. The 650 meter North face of Mt. Nemercka (2.485 m) attracts our gaze and at its base we rest at the Sopot Waterfall. After returning to our vehicle on the same path, a short ride takes us to a restaurant for a light lunch. Afterwards we continue to the warm thermal baths of Benje, it's the sulfurous waters at the entrance of the Lengarica Canyon are said to have a healing affect on many kind of ailments and will help us to forget any aches caused by the trek. In the afternoon we travel through the mighty Kelcyra Gorge to Gjirokaster (62 km / 1:30 h), a UNESCO world heritage site and birth place of both former dictator Enver Hoxha and Albania's best known writer Ismail Kadare. Here we follow in the footsteps of Kadare's book "Chronicles in Stone" and visit one of the Ottoman mansions on a guided tour with the owner. We overnight in the old town and enjoy a dinner of local specialties. In the morning, we have ample opportunity to further explore the "City of Thousand Steps". Join the group to climb up the steep alleys for views of the surrounding valley from the castle or explore individually the handcrafts market and shops that line the cobblestone streets. Later we say farewell to return towards the the vibrant capital city Tirana (225 km / 4:00 h), where the lively streets of the modern night life district make for a stark contrast to our village overnights. Here we celebrate our memorable visit to Albania and get to know a very different perspective of the young and modern Albania. Time permitting, we may visit the new bazaar or one of the underground bunker exhibitions (optional), before transferring to the airport for your flight back home (30-40 min). On this trip we will be staying some nights in family run guest houses along the trail which have a cosy feel to them and you will enjoy the serenity and friendliness of the people there. The rooms are 2-4 people with shared facilities. The other couple of nights will be spent in simple boutique hotels with en-suite bathrooms . Single rooms might be a bit difficult and unavailable in some areas but please tell us in advance so we can check the availability. Food will be cooked by the families in the guesthouses or by the shepherds in mountain huts which will give you a taste of delicious home made food. We can cater to most diets so please let us know in advance if you have something in specific so we can make sure its taken care of. The hike is a challenging one as the trail is not very well defined which will only add to the beauty and serenity of the trip. You will also indulge in the life of the farmers, shepherds and the beauty of being surrounded by mountains. You will be hiking on average around 5 to 6 hours sometimes on rocky terrain and steep slopes so you need to have good fitness to be able to enjoy the hike.